We took the train to Florence – very easy. I love train travel. It’s clean, efficient, no hassles like air travel and the train stations are almost always right in the center of town. Plus you can sleep on a train, unlike an airplane. Trains are perfect for a little cat nap. The rhythmic, gently rocking motions are perfect for lulling you to sleep. And the seats are much more comfortable than an airplane seat. Why? We stayed at our favorite place, Pensione Bencista. It’s up above Florence in nearby Fiesole where the air is clean and the views are tremendous. It’s owned by Beatrice and her family, who have run it for about 100 years. We were very saddened to learn that Beatrice was in Rome having treatments for cancer. It was such a shock to us and we had a hard time settling in knowing that we wouldn’t see her on this trip. We tend to think that things stay frozen in time while we’re away, but, of course, life goes on and good and bad things happen. This was a bad thing. We had dinner our first night at Bencista. Very simple, but out on the terrace overlooking Florence. First course was polenta, then roast chicken and pork, with salad and roasted potatoes. Then creme brulee for dessert. The next day we just strolled around Florence. No museums, no churches, no standing in lines. We had lunch at Trattoria Fagioli near Santa Croce. It was a wonderful little place with waiters who spoke very little English and a mostly Italian crowd. 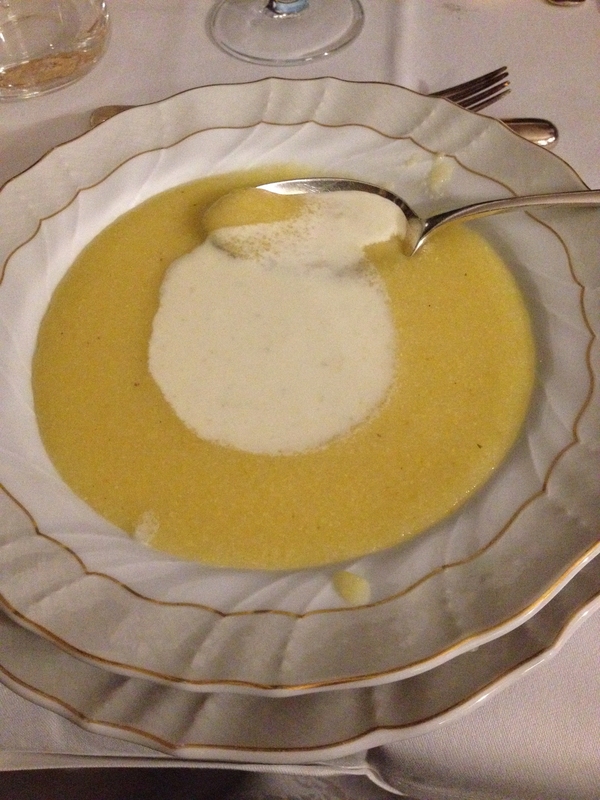 I had the house special which is a creamy bean soup and Steve had ravioli with ricotta, pear and pecorino. And the cutest little half litre of Chianti in the classic fiasco bottle. Excellent! For dinner that night we wanted to go up to Fiesole to a restaurant that we’ve been to many times over the 20 years that we’ve been coming here. I’Polpa is known for its meat and Steve was all set to have his first beef in almost two years. We got up there only to discover that it has closed. For good. Again, time marches on whether we’re there to witness it or just show up every couple of years to see its handiwork. I had pacchieri pasta with sausage, tomatoes, parmesan, and arugula. We had a nice Chianti and went away happy despite the change of venue. We left the next morning for Anghiari. We took the train to Arezzo and then rented a car there. By the time we got the car it was just about lunch time so we decided to have lunch at one of our favorites just off the main piazza. If you carefully orchestrate your trip, you will not miss one single food opportunity and that’s what we try to do. Lunch at La Torre di Gnicchie was what is always is – divine. It’s a tiny place – probably holds 30 people and the walls are covered in wine bottles from all over Italy. I love a place where you can eat and shop for wine all at the same time. I had one of my favorites – Pappa al Pomodoro and Steve had Farro Soup. A couple of different bruschetti and a nice glass of Montepulciano and we were set for our drive to Anghiari. Next stop – home!